The Abuja-Kaduna rail project is a part of Nigeria’s country wide rail modernisation programme. Image courtesy of Jkan997. The 186km-long Abuja-Kaduna rail line features single standard gauge tracks. Image courtesy of Federal Ministry of Information, Nigeria. 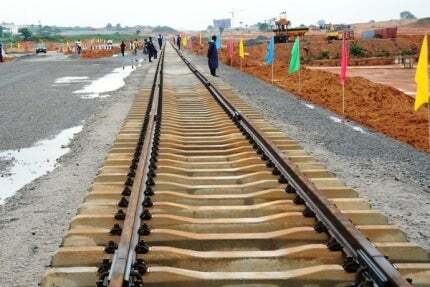 The track laying ceremony for the Abuja-Kaduna line took place in July 2013. Image courtesy of Federal Ministry of Information, Nigeria. Built by China Civil and Engineering Construction Company (CCECC), the Abuja-Kaduna line will operate with fast passenger and cargo trains. Image courtesy of Federal Ministry of Information, Nigeria. The Abuja-Kaduna rail line is one of the first standard gauge railway modernisation projects (SGRMP) undertaken in Nigeria, the most populous country in Africa. The standard gauge line connects federal capital city Abuja with its commercial capital Kaduna, enabling faster movement of goods and people between the two cities. "The construction of the Abuja-Kaduna rail line started in February 2011 and was completed in December 2014." The construction of the Abuja-Kaduna rail line started in February 2011 and was completed in December 2014. China Civil and Engineering Construction Company (CCECC), which is also constructing the Lagos Rail Mass Transit System in Nigeria, built the line for the Nigerian Federal Government. The project employed approximately 4,000 people and is expected to create more than 5,000 additional jobs during operation. The railway modernisation initiative in Nigeria aimed to replace the existing narrow gauge system with the wider standard gauge system, while allowing high-speed train operations on the railway network. The $8.3bn contract for the Lagos-Kano standard gauge modernisation project awarded to CCECC in 2006 marked the beginning of the initiative. However, the project couldn’t be implemented due to funding problems. It was later re-scoped into different standalone segments and the existing 1,124km narrow gauge Lagos-Kano line was rehabilitated. Nigeria’s largest city Lagos is constructing a light rail system under a public private partnership (PPP). The project is sponsored by the Lagos State Government (LSG) and will be developed by Lagos Metropolitan Area Transport Authority (LAMATA) on behalf of LSG. The Abuja-Kaduna segment is the first to be implemented as part of the Lagos-Kano standard gauge project. The next segment to undergo standard gauge renovations is the 312km-long Lagos-Ibadan rail line, which is a double-track standard gauge line scheduled for completion in 2016. A $1.53bn contract was awarded to CCECC in August 2012 to deliver the project within four years. The other standard gauge line projects in the pipeline include the Lagos-Benin City (300km), Benin-Abakiliki (500km), Benin Obudu Cattle Ranch (673km), Lagos-Abuja high-speed (615km), Zaria-Birnin Koni (520km), Ega nyi-Otukpo (533km) and Ega nyi-Abuja. Other projects scheduled are the Port Harcourt-Maiduguri line (1,657km), Ogoja-Maiduguri, Kano-Gamboru Ngala, Kano-Jibia, and Ilela-Minna rail lines. Public-private partnership (PPP) strategy is being explored to develop these standard-gauge lines. Abuja-Kaduna is a 186km line with standard gauge railway tracks from Idu, near Abuja, to Kaduna in the north-western region of Nigeria. It has nine stations and features both passenger and cargo trains. The passenger trains on the line can operate at a speed between 200km/h and 250km/h. The travel time between Abuja and Kaduna will be reduced to one hour and each passenger train can carry up to 5,000 commuters. The cargo trains, carrying 800t of goods, will take one and half hours to travel between the two cities. The Federal Executive Council (FEC) sanctioned N1.1bn ($6.6m) in October 2014, for the procurement of two locomotives for the Abuja- Kaduna standard-gauge rail lines. The Abuja-Kaduna rail project is estimated to cost $874m. China‘s EXIM bank provided $500m as a concessionary loan for the project. The remainder was provided by Nigeria’s Federal Government. The Abuja-Kaduna rail project was finalised in 2009. The contract for building the new line was awarded in December 2010. Track laying for the single standard gauge line was officially launched in July 2013. "The standard gauge line connects Nigeria’s federal capital Abuja with its commercial capital Kaduna." The rail line construction was 68% complete by July 2013 with the earthwork and hydraulic structures for the project 92% and 87% complete, respectively. Approximately 85% of the construction was finished by October 2014 and final works were concluded by early December. The rail line involved the construction of 30 railway bridges, including five box bridges. The bridges are being built using precast T-beams. By mid-2013, 187 out of the total 348 precast T-beams were produced and 52 of these were successfully installed. Each T-beam is 2.5m in height and 120t in weight.